Feedback on relevancy is arguably more valuable than increased visibility in the context of Google AdWords. Pay PPC campaigns open opportunities to collect meaningful data about user behaviour that were not readily available 10 years ago. Google AdWords is an especially valuable tool for increased visibility, more relevant site visits, and meaningful data analysis with the introduction of Enhanced AdWords PPC campaigns. Must Read: Does Advertising In AdWords Help In SEO? Enhanced PPC allows users to view targeted PPC ads when conducting mobile searches. It also allows for more advanced data analysis as mobile searches and clicks are also assigned a geographic location. The ability to increasingly analyse meaningful data should eventually outweigh the increased visibility and connections Google AdWords can provide. One of the most valuable assets, if not the most valuable asset, to any Google AdWords campaign is the amount of data that can readily be collected and analysed. In addition to boosting your AdWords score and search engine rankings, your Search Query Report will let you know how relevant your ads are to searchers. Attracting a few million unique hits is great. However, it is not as valuable getting several thousand unique hits from the right kind of customer. The purpose of search engines has always been to better connect the right searchers with the right resources. Relevancy and re-targeting are crucial when examining your overall marketing and branding strategy as explained here. Just like searchers want to find the business that can best meet their needs, business owners want to find the customers that can best suit theirs. Many companies offer multiple lines of products or services. Make your ads as relevant as possible by splitting ad groups to their core keywords. For example, a company that sells different kinds of home decor could make multiple ad groups to connect with customers that are looking for a certain brand of sofa, customers that want to purchase a certain brand of kitchen accessories, customers that are interested in a certain line of pottery etc. Home decor can be seen as too broad in the context of Google AdWords. By making different ads for top-selling home decor items, customers can find what they want easily and choose to browse the rest of your website if they wish. The rising popularity of mobile search has made search trends more important than ever. People increasingly use their smartphones and other forms of mobile search for almost everything offered on a personal computer. Before the popularity of mobile search, search trends were limited as people typically had to be at home to browse the web for new places to eat out, new treasures on e-commerce platforms, etc. Traditionally, prime-time for search was on Sunday evenings, much like prime-time television shows. With the widespread use of mobile search, businesses can see meaningful trends in when and where people choose to search for items or purchase them. Also, think about how you could provide a better service with new trends in search. Boosting sales could be as simple as opening a brick-and-mortar store on Sundays after noticing that many people searched for a comparable business on Sundays near the store-front. Initially, your PPC campaigns can give your website higher visibility to an interested audience. The concept of relevancy for searchers is also intended to help businesses. Ultimately, you want to build enough online buzz about your business so that PPC campaigns are not needed to increase visibility or give you a notable online marketing presence. By connecting with the most targeted audience, you can later build your online presence organically via independent brand advocacy from passionate customers, increasingly creative social media marketing strategies, and the best new content possible on your website. 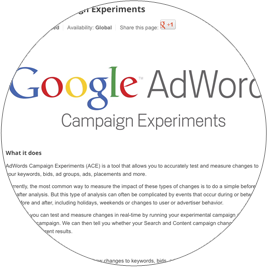 In essence, a great Google AdWords campaign will make itself obsolete in one way. In another way, the value of continual user data is necessary to keep up with the changing landscape, both online and offline. The ability to gather meaningful user data in real-time is difficult to match. A short decade ago, the idea of mobile search was largely unheard of. Today, mobile search is a major factor in online marketing success. Just imagine what game-changers the next ten years will bring. Dorian Travers is the Internal Marketing Strategist at digital marketing firm Wpromote.com, and has always had a particular interest in content marketing and creating brand development strategies.